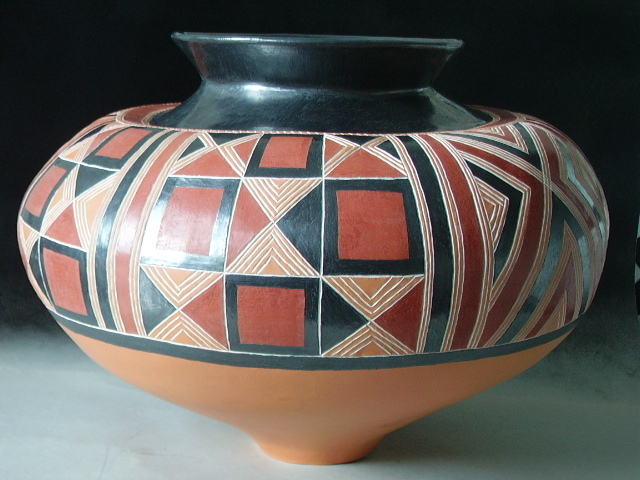 I mainly do pre- and early history pottery, focusing on the celtic Hallstatt era (800-450 BCE). Based on excavation reports I create reconstructions, always without a pottery wheel, just like their models. Before setting out to work, I will allow a piece to impress me, in order to, hopefully, understand it in its entirety. Then I strive to reflect the impression it made on me in my piece of pottery. 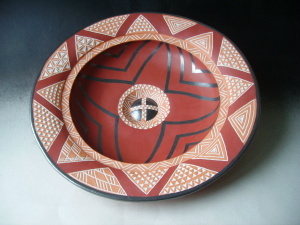 The resulting unique piece has a personality of its own and, just like its model, carries slight intentional irregularities, traces of manual work. Each closer look will reveal a new detail – and will bring the piece of pottery to life. Take, for example, a piece of Alb-Hegau ceramics painted in graphite red: it takes days, weeks even of experimenting before I feel I have at least come close to techniques long forgotten. And it is quite wonderful indeed to witness timeless beauty and to be able to revive it through my pottery. Once a piece is completed, after hours, days at times, of work and drying, I feel deeply satisfied at last. Not just because of the beauty in having created, out of initially muddy sludge, a new receptacle … Thinking of the fact that excavated sherds often go back to 2500 years and that some pieces of my pottery might last another millenium … I consider myself a true transmitter of ancient European traditions. 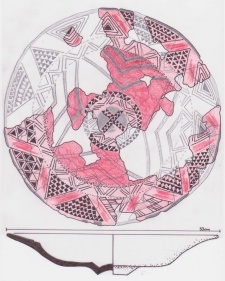 I recapture forms and techniques to carry them into the future, through my vessels, and I feel part of this transmission process. In order to relax both spirit an hands I take courses in various subjects, I browse through the universitiy library at the dapartment of archaeology or I draw fresh enthusiasm from special reports offering new subjects. Never too old to learn, as the saying goes … Hence, in the realm of archaeology I also read extensively about the pottery of the kingdom of Elam, of South and Central America and about the art of sub-saharan Africa arount 1900. Also, I created a number of „free-style“ modern pieces. A selection of them is also shown here. In case of works wich refer to indigenous peoples of other continents, I strive to find a middle ground between ´inspiration´ and ´creation´. Merely imitating the art of a people still intact would be wrong, in my eyes. I do not feel entitled to do so. Instead, I modify, alienate, get inspired, develop further, play … and the results are manifold. If I made you curious, please feel free to browse. Manchmal, wenn ein Vogel ruft Oder ein Wind weht in den Zweigen Oder ein Hund bellt in fernem Gehöft Dann muss ich lange lauschen und schweigen. Meine Seele fliegt zurück Bis wo vor tausenden von vergessenen Jahren Die Vögel und der wehende Wind Mir ähnlich und meine Brüder waren. Meine Seele wird ein Baum Und ein Tier und ein Wolkenwesen. Verwandelt und fremd kehrt sie zurück Und fragt mich. Wie soll ich Antwort geben?